In March 2015, I shared an update for the Seven Septs of Laois. There is a new update and I am once again pleased to have permission to share and document the progress. Perhaps it’s a coincidence that last night I was going through a few papers and found the business card of Michael J. Keane, who I had the pleasure to meet at Back to Our Past in Dublin in October 2016. I also had the honor of assisting him with taking his first DNA test. I’m thrilled that I was able to bring home a copy of his book, From Laois to Kerry. Thank you to Lorna Maloney for noting our common research interest and introducing us. Our DF21 project administrator, David R. Moore, sent out the following email last week. A link to the PDF attachment follows the text. The rather long document that is attached to this email is being sent to kit holders (and others who might be interested) of R-L1402+ men. These men form 5 distinct clusters. Basically this means that the men in each cluster share a common patrilineal ancestor that the others don’t have. Two of these clusters are proven to have deep ancestries that go back to County Laois, Ireland and the Seven Septs of Laois. The others almost certainly do as well, but their lines of descent probably left Laois prior to the general adoption of surnames in Ireland. An even older branch, L1403+, A5409+. L1402-, may be from County Laois too considering it includes a large group of Moores (Viar). Or this branch may have branched off prior to the L1402 ancestor of the 5 clusters mentioned earlier arriving in Laois. I think it quite likely that L1402- men will eventually be shown to have deep ancestry connection to Ulster, the homeland of the eponymous ancestors of the O’Mordha (O’Moores). Men (living today who have been DNA tested) that make up the oldest cluster, L1403+, A5409+, L1402-, have surnames – Moore, Viar (Moore), Gillespie, Coogan, Murphy, Holmes and McDonald. Men that make up the older L1402+ cluster are – Phillips and Mahon. Most of these went to Wales. Men that make up L1402+ clusters that we can not yet say when they might have left Laois are – Morrison, Downing, Downey, McEldowney, McMorris, McNeil, McAdams, Reynolds, Kewley, Lewis and Johnson. Most of these, or a common ancestor, are known to have gone to Scotland. Might the Vikings have a hand in this?? Men that make up the Seven Septs of Laois clusters have surnames – Moore, Devoy, Kelly, Hargraves (Kelly), Pedigo (Kelly), Dowling, Doolin, Darst (Dowlearn), Dolan, Devine, Smith, Phelan, Lawler, Lollar, Viljoen (Lawler), Hoban, Pemberton, James (? ), Bassett, Kitchen, and Hamilton. The total is about 100 men. 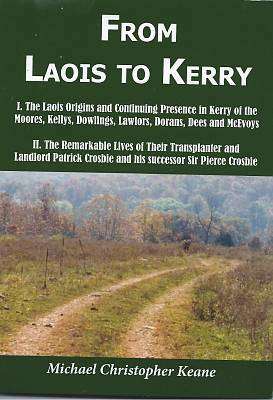 The attachment has to do with a new book by Michael Christopher Keane about the Seven Septs of Laois and their transplantation to County Kerry, and the attachment includes various articles related to this event. Some of you will find this of interest, others not so much. But even if you do not have a Seven Sept of Laois surname, these are your genetic kinsmen.